eBay is in the process of building up its own internal advertising sales team, cutting ties with the outside sales firm along the way. eBay is also eliminating product ads that link to other websites, and replacing them with advertising options that help brands drive sales directly on eBay. The moves come as Amazon continues to ramp up its own products for advertisers, particularly when shoppers search for products on its site. The changes are also meant to appeal to big brands that are looking for new ways to drive sales through digital advertising, as e-commerce eats up more of traditional retail sales. ​This is part of eBay restructuring its approach to ads, which finally saw the end of ads pointing off-site. 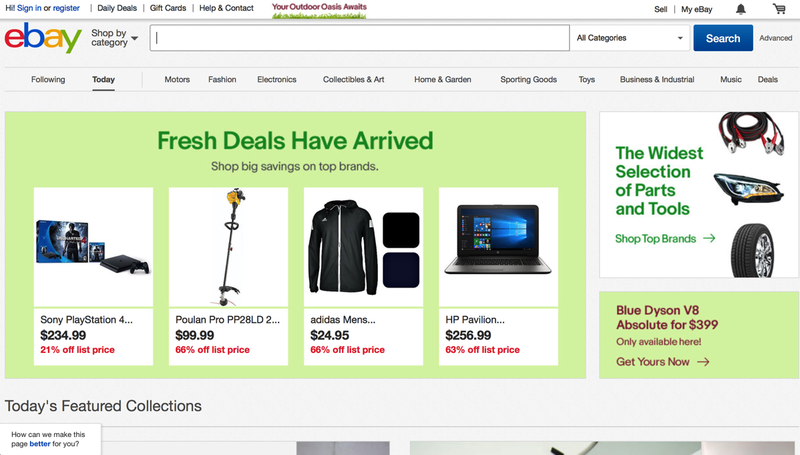 eBay made $313 million in marketing services revenue in the fourth quarter. (-4% yoy) ​For comparison, some estimate that Amazon’s advertising business made $1.2 billion in net revenue worldwide, with $940 million of that in the US. If you want a model for the advertising moves that Amazon and eBay are making, look to China and Alibaba’s Taobao marketplace. Taobao does not charge its sellers a listing fee or cut of sales. Rather, it makes most of its money from advertising — sellers pay for ad placements that give their products more visibility on the site. [A] few years ago, EBay’s local head realized that Russians mainly use the site for cross-border commerce. So, Ilya Kretov tweaked the software to let sellers easily target foreigners, resulting in a 50 percent surge in exports by Russians last year. Now, EBay has handed him 120 countries to replicate the achievement. “In most emerging markets, where we don’t have localized websites, the penetration of global e-commerce players is insignificant compared with the internet audience — it’s a good source for growth,” Kretov said in an interview in Moscow. Kretov’s sphere of responsibility now includes Africa, the Middle East and most of Europe, excluding large developed markets such as the U.K., Germany, France and Italy, where EBay is already a popular domestic marketplace. Kretov’s team has started activities to boost sales in several dozen countries. This includes rolling out software dubbed EbayMag, which lets listings be shown in other languages, so merchants can tag countries where they want goods to be displayed. EBay can expand cheaply to new markets because, unlike Amazon, it doesn’t need to build warehouses and shipping centers, Kretov said. In Russia, EBay has about 3 million monthly users, according to researcher Mediascope. That’s not much compared with an internet audience of about 80 million. Failing to become a popular domestic marketplace, EBay has focused on cross-border sales as a niche player, said Fedor Virin, co-founder of researcher Data Insight. It barely has a footprint in many of the markets now targeted by Kretov’s team, Virin said. But still, at least there is the smell of possible forward momentum coming from eBay again. Given the ongoing successes of diverse marketplaces such as Amazon Marketplace, Taobao or Rakuten, there are now enough blue prints for lesser visionary1 companies like eBay to take cues. eBay still has the market power to become very relevant again in shaping and being part of the future retail industry.